Fired up and passionate? A total jerk? You be the judge. A kiss is just a kiss—unless it happens in the ninth inning of a playoff game. Then, all hell breaks loose. So did the A’s. After the game, outfielder Josh Reddick told reporters that he “didn’t appreciate it,” that he “thought that was immature” and “not very professional.” Cespedes said that he may kiss his bat the next time he connects against Alburquerque. By Monday afternoon, however, during an off-day at Oakland’s O.co Coliseum, the A’s were downplaying the incident as a non-story. For his part, Alburquerque, 26, said Monday that he intended no disrespect to Cespedes or the A’s, and that his actions were colored by “the emotion of the game.” Regardless, the second-year pitcher, a native of the Dominican Republic, was pulled aside after the game by Miguel Cabrera, Alex Avila and Octavio Dotel, who explained to him the reality of the situation. While this particular antic isn’t exactly commonplace, it does have some historical precedent when it comes to similar showmanship. Perhaps the most prominent example occurred during Game 7 of the 1982 World Series, when St. Louis Cardinals pitcher Joaquin Andujar fielded a grounder by Milwaukee’s Jim Gantner, then held the ball while watching watch Gantner run until the final possible moment, firing the ball to first base just in time. Gantner turned and called the pitcher a hot dog (among other things), Andujar responded with a parade of his own curse words at high volume, and the pair had to be separated. Closer to the tenor of Alburquerque’s display was Sammy Sosa, who in a spring training game in 1999 hit two home runs against Arizona’s Todd Stottlemyre, and bowed to the crowd, Japanese-style, after each. Sosa said afterward that his intent was to show respect to the fans. Stottlemyre didn’t buy it. In neither case did the pitcher retaliate. In fact, the most appropriate form of retaliation is the one utilized by Philadelphia in 1993 against Bryan Hickerson, after the Giants reliever snared a line drive by Wes Chamberlain to end the sixth inning and spiked the ball into the turf. “That infuriated us,” said Phillies outfielder Milt Thompson. Dusty Baker, then the Giants manager, said that Hickerson’s display was not directed at the opposing dugout, and that if the Phillies wanted to take it personally, it was up to them. They did, and it was; Philadelphia, down 8-3 at the time, came back to win, 9-8, in 10 innings. Ultimately, Avila had the most concise take on the subject. The view shared by members of the Brewers' traveling party? Between the name-calling and the occasional hit batter and the Beast Mode, this Brewers-Cardinals NLCS has not been short on tempestuous fun. Wednesday, however, things took a bit of a different turn. Whether it’s a bizarre form of institutional retaliation or simply shoddy planning, St. Louis’s decision to forgo the standard seating section for the families of Brewers players and staff—opting instead to spread them out around the ballpark—has been met with considerable anger. 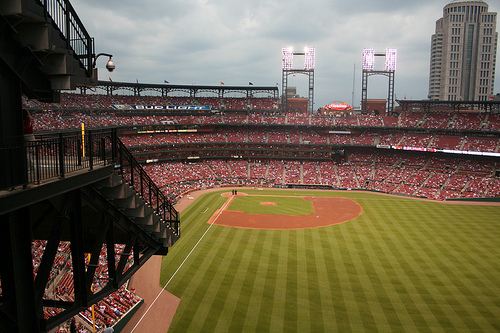 Leading to the theory that the decision was directly influenced by the team’s dislike for the Brewers is the fact that St. Louis reserved precisely such a section for its opponent in the NLDS, the Phillies. Cardinals GM John Mozeliak denied that gamesmanship was behind the decision, but at the very least, the club has some precedent on which to build. Giants slugger Jeffrey Leonard introduced the phrase “one flap down” into the American lexicon during the playoffs in 1987. That was the name of the peculiar home-run trot he had devised (but rarely used) the previous season, during which he let his left arm dangle limply at his side while dipping his inside shoulder into the turn at each base. The slugger decided to resurrect the practice after he and teammates noticed that the Cardinals organization placed Giants family members and friends in nosebleed seats for the first playoff game in St. Louis. Leonard had come upon his trot by accident during a 1986 game, after he hit a home run against Chicago’s Scott Sanderson. First base coach Jose Morales, who usually met passing runners with an arm raised for a high-five, this time had his hands at his sides. It wasn’t until Leonard was atop the bag, ready to turn toward second, that Morales’ arm shot into the air in a belated attempt at congratulation. Leonard’s instinctive response was to duck under it, dropping his left shoulder in the process and letting his arm dangle as he rounded the base. Then, for reasons he can’t much explain, he held the pose as he continued the circuit. The Brewers have plenty of ready-built responses of their own to call upon, starting with various permutations of Beast Mode and ending with Morgan’s T-Plush signs. They should be wary, however: Leonard was drilled for his actions by Bob Forsch in Game 3 back in ’87; a similar response from Tony La Russa’s Cardinals would hardly be unusual. Update (10-18): Apparently that wasn’t all of it. Now that the NLCS is complete, we hear that Zack Greinke‘s wife, Emily, was none too pleased with her seats, tweeting during a game in St. Louis that she’d been relegated to a spot down the left-field line. The tweet has since been deleted, but Larry Brown Sports saved the accompanying picture, allegedly shot on location. The play that started it all. 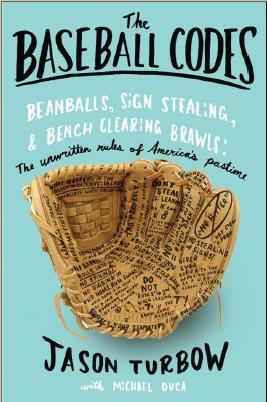 There’s a reason that baseball doesn’t have the chest-thumping of the NBA, or the equivalent of a football player leaping up after a two-yard carry with a first-down signal. Baseball doesn’t have much tolerance for that kind of thing. Save for game-winning plays, look-at-me moments are nearly universally frowned upon. 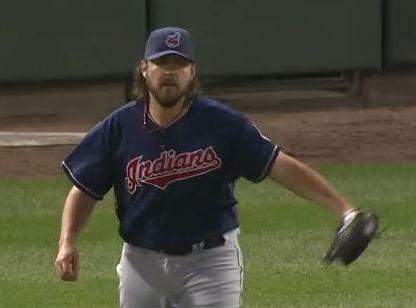 Which is part of the reason that Andres Torres and the Giants aren’t looking at Chad Qualls in a friendly light today. With the Giants trailing 5-3 in the seventh, Torres won his first battle with Qualls, working back from a 1-2 count to see 16 pitches—fouling off 11 of them in an at-bat that took more than eight minutes—before drawing a base on balls. 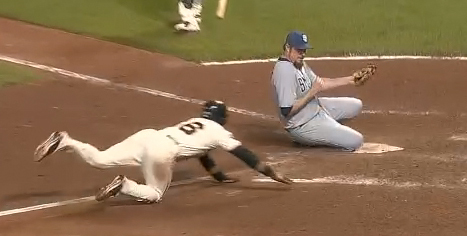 He then stole second, and advanced to third on an infield grounder. That’s where he was when a Qualls pitch squirted away from catcher Nick Hundley; after delaying to assess the situation, Torres belatedly broke for home. It’s understandable that Qualls was pleased with the development, especially in light of the frustration he must have felt after Torres’ marathon at-bat. 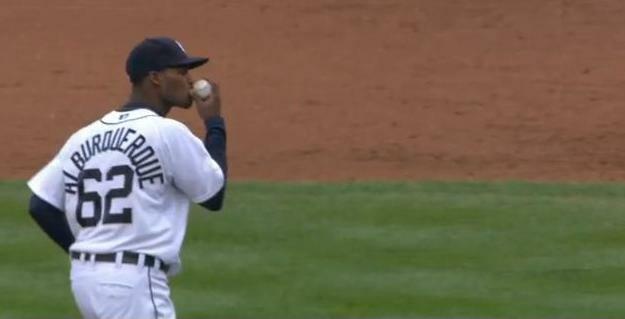 Which doesn’t diminish the fact that he spiked the baseball and yelled at Torres on his way back to the dugout. Direct payback for Qualls is unlikely, since, as a reliever, it’s a longshot that he’ll come to bat against the Giants. Retaliation against one of the Padres’ hitters isn’t out of the question but is similarly unlikely unless San Francisco breaks through with a passel of early runs today, giving their pitchers a bit of leeway when it comes to things like settling scores. Then again, these teams face each other 14 more times this year. There is, as the saying goes, a lot of baseball yet to be played. Jose, meet John. John, Jose. Which is to say, dealing with adversity is much easier when you’re on top of the world than it is when you’re getting your head kicked in every five days. The latter scenario pretty aptly describes Danks this season, especially after giving up nine earned runs over four innings to Toronto on Sunday to run his record to 0-8 with a 5.25 ERA. Which is why it shouldn’t be too surprising that he’d show some thin skin when, having just retired the best hitter in baseball on a 3-2 pitch, said best hitter in baseball gave him an earful. Toughen up, one might tell Danks; Bautista didn’t mean to disrespect you. But think about it this way: Was Bautista frustrated by hitting a popup because he consistently expects better from himself, or was he frustrated because he had just seen two fat two-seamers from a pitcher who had given up four runs over the course of the previous two hitters, including a two-run homer to Corey Patterson—only to have watched the first for a called strike, then failed to hit the second past shortstop? In other words, is Bautista that ferocious a competitor, or was he saying—in an extremely visible way—I can’t believe this chump just got me out? It’s clearly possible that it’s the latter, which is all Danks needs to be justified in his reaction. 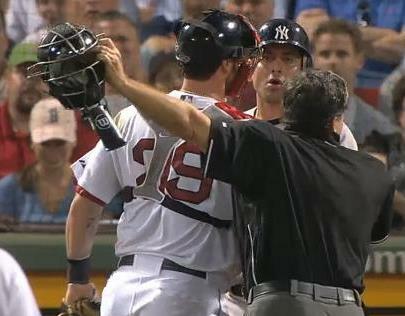 Danks started shouting down Bautista from the moment he spiked the bat, and Bautista had a word or two in response. Retaliation in the future: Likely. This isn’t always the case, of course. Last May, Carlos Lee reacted similarly after popping up against Chris Carpenter, and heard about it from the St. Louis pitcher. One difference: Carpenter was 4-0 with a 2.80 ERA at the time, and though he was clearly frustrated in having just given up the game’s first run a batter earlier, he was (and still is) too good to take things as personally as he did (and does). Danks, at least right now, is nowhere near that point. The lesson of the day: Play it safe and keep your frustrations to yourself, big leaguers, at least until you find your way back to the dugout. * I should probably note that I don’t have the foggiest idea if John Danks even has a girlfriend, let alone if he’s married, and certainly possess no information about his potential relationship issues outside of the purely hypothetical situation described above. I wish John Danks nothing but many years of avid bachelorhood or wedded bliss, whichever suits him better.